The Stewardess with a License to Kill is Back! Katy Touchfeather is a fun-loving, British spy with a cheeky attitude and lethal skills who travels the world as a stewardess. Her latest assignment is to bring down what appears to be a gold smuggling operation…but is something far worse. It’s a globetrotting, espionage adventure that takes her from London to a lavish yacht on the high-seas, from the jungles of Africa to the beaches of the Bahamas, and that pits her against one of richest men on earth and a deadly torturess who loves to extract information in agonizingly creative ways…and can’t wait to try them all on Katy. 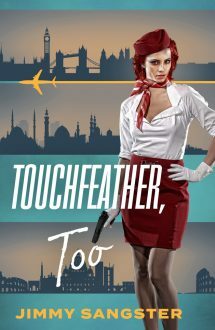 More bright feathers in the stewardess cap of Katy Touchfeather, espionage agent. She's Nancy Drew superhormone-genized.